WooCommerce Stripe Payment Gateway (by WooCommerce) download here. Once you have installed and activated the Stripe Payments plugin, you will need to enter your Stripe Sandbox API credentials into the plugin before you can start using it. To do this, navigate (in your WP Admin) to Woocommerce > Settings > Checkout > Stripe (either at the top of the page where all the plugins are listed as text, or at the bottom where the enabled/disabled gateways are displayed). Once there, fill in the "Test Publishable Key" and "Test Secret Key" fields with the values provided by your Stripe account. You will also need to ensure that "Enable Payment via Saved Cards" is enabled, as this is required for Autoship Cloud to create future orders. Notes: The fields are labeled "Test Publishable Key" and "Test Secret Key" because the plugin is set to use "Test Mode". You will need to supply the API keys from the Stripe account that corresponds the environment in which you will be using the gateway (we are starting in the Test Mode to ensure that the plugin is working without creating actual charges). Additionally note that "Stripe Checkout", "Payment Request API", and "Apple Pay" are not enabled. Autoship Cloud is not compatible with these features, and they must remain disabled. Once these have been set, click "Save changes", and complete a checkout from your store to ensure that Stripe is working. 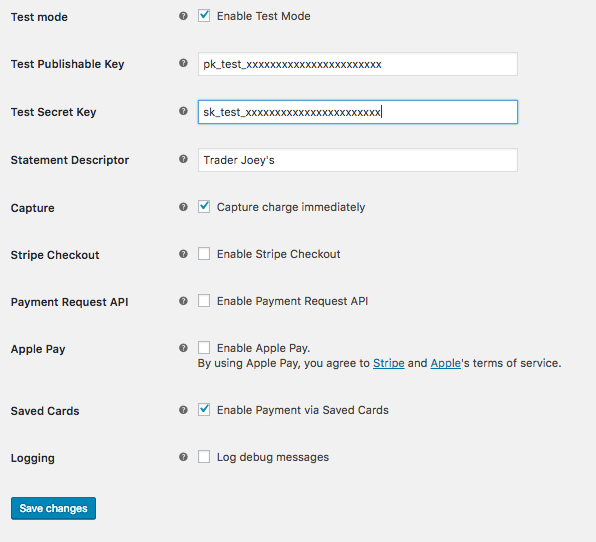 Make sure that "Test Mode" is enabled (unless you are ready to begin using the gateway in Live mode), click the "Payment Method Type" dropdown and select "Stripe", enter the API credentials from the previous section in the appropriate fields. Before using a payment gateway in Live Mode, it is necessary to ensure that it works in Test Mode (sometimes referred to as Sandbox Mode). 2. Put an Autoship enabled item in your cart. 3. Complete a checkout using Stripe Payments as the payment method, using sandbox credit card info, and filling in the "Create Password" field (this should be required). 4. Verify that the order has successfully processed. 5. As the same customer, visit My Account > Autoship Schedules, and verify that you have a schedule created, and that the schedule items and frequency are correct. 6. Log back into your site as WP Admin, navigate to Autoship Cloud > Scheduled Orders, and verify that the newly created schedule is present in your list of Scheduled Orders. Once you have successfully completed an Autoship Cloud checkout and verified that a Scheduled Order was created and the payment method was saved, you are ready to enter Live Mode (in which actual charges will be created). 1. Enable "Live Mode" inside of your Stripe account. 2. Navigate to WP Admin > Woocommerce > Settings > Checkout > Stripe, and uncheck the box for "Enable Test Mode", and click "Save changes". 3. Navigate to WP Admin > Autoship Cloud > Payment Integrations. Click the pencil icon at the right end of the record for your Stripe integration to edit. Uncheck the box for "Test Mode", and click "Save".